It is unfortunate that healthy food is often more expensive than unhealthy food. To many moms who are trying to stretch the food budget as far as they can yet feed their families wholesome nourishing meals, this is discouraging. The problem is, the long-term cost of eating low-quality, low-nutrition foods can possibly be quite high both in terms of dollars and of quality of life. So, what's a mom to do? I have found some tips that may be helpful. When I first felt the Lord was calling us to eat more healthy foods, my husband began encouraging me to shop at our local Whole Foods. My first reaction was fear: How on earth will we be able to afford that? "Just buy what you can and we will eat that. ", dh would reassure me. Well, after analyzing my first few "healthy" shopping trips, I realized that I was spending way too much on snacks and drinks. After all, they were healthy! I had a lot to learn. And learn I did and I am still learning. I was inspired to write this post about my experiences after reading a similar post by Melissa over at TotalMamaMakeover. --Shop the outside edge of the store. Focus on produce, meats, seafood and dairy products. These are generally located around the outside of the store. --Avoid "snack" products and store-bought drinks. These are the products found in the middle of the store. Even healthy, organic snacks and bottled drinks are relatively expensive and certainly not necessary for health. --Avoid prepared foods. Although these meals, such as frozen foods, are cheaper than eating out when you are in a jam, they really add up at the cash register. --Seek the best deals on non-food items. I tend to use Aldi, WalMart, drugstore/grocery store sales or Costco (bulk) for items such as paper goods. --If you are starting on a journey of eating more organic foods, prioritize your more expensive organic purchases using the Dirty Dozen list to find out which fruits and vegetables are most contaminated with pesticides and focus on purchasing only those and buying the others conventionally grown. --More and more stores are offering organic and healthier foods for less. Big box stores such as Target and WalMart have surprised me with their organic selections and now even Aldi is in on the act, offering organic foods for less as I reported in a previous blog post. 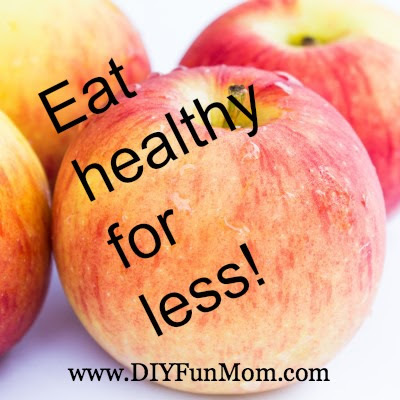 These methods have made healthy shopping for my family much more do-able on a budget. Give it a try- That is today's DIY challenge. Challenge yourself to take control of your grocery bill and healthy eating for your family. Be creative, find solutions that work for you and your family.